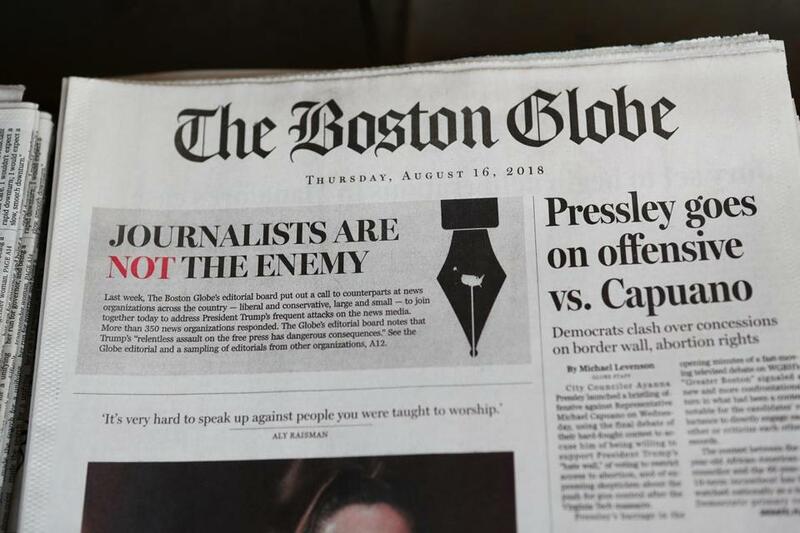 Re “Journalists are not the enemy,” (Editorial, Aug. 16): As a reporter who has covered local, national, and foreign stories, I know only too well that President Trump is not the first to attack us. He takes his place in a long line of those who disparage and threaten journalists, fostering a dangerous global environment in which we struggle to do our work. I experienced this firsthand while working as an editor of a religious newspaper on assignment to report on malfeasance in the religious community I lived and worshiped in. The subtle and not-so-subtle disparagement (they tend to walk hand-in-hand) I endured because of my pursuit of truth were only two aspects of the hostilities I faced on a daily basis. Other pressures included efforts by lobbyists, who never tired of trying to spin the stories I was pursuing, and efforts by religious leaders who resorted to ostracizing me from events. They did not succeed: My stories were doggedly pursued and published. News organizations face terrific pressures and put themselves on the line daily to report the news. But don’t expect those who practice and take delight in mudslinging to cease and desist: Their appetites grow voracious each day, and their numbers are burgeoning. The writer is a freelance journalist and former editor of the Rhode Island Herald. Thank you for making this front and center. The Globe and other media outlets across the country should be praised for outing Trump’s dangerous and incendiary rhetoric attacking the press. Dictators look to muzzle a free press, while promoting their propaganda through a state-run media. Trump is working on the former, and already enjoys the latter with Fox News. Freedom of the press was not actually in the original US Constitution, but it is a vitally important amendment (the first). George Orwell said, “Freedom of the press, if it means anything at all, means the freedom to criticize and oppose.” Opposing is easy in the troubled United States right now, but criticizing is not. The executive branch seems to be opposed to any kind of criticism whatsoever. Your graphs in “How Americans view the press” (Opinion, Aug. 16) were revealing. The Republican responses regarding the news media and the president’s authority to control it are significantly more negative than Democrat and independent. However, the responses for “Freedom of the press is essential for American democracy” are not that different. This tells me that Republicans perhaps are showing more emotion and less logic when considering democratic fundamentals. Somehow all the complaining on the part of the media about Trump’s attacks on the press ring hollow. Yes, a free press is critical to our form of government. But nowhere does it say that those engaged in it are above criticism. Which, in the end, is all that Trump has done. No real restrictions have been imposed. Anti-Trump stories still run daily in the papers, and on a near-continuous loop on much of radio and television. In fact, rather than restricting this speech, Trump’s “fake news” rants feed it and help it prosper. If a number of people on the right are starting to agree with the enemy-of-the-people theme (and I expect and hope that much of those poll responses are simply making a statement rather than expressing a belief, particularly with the high percentage agreeing a free press is essential to democracy), maybe it’s because they have perceived a not-so-subtle bias against their side for years, well before the rise of Trump. The press is free to pick sides, but don’t complain when your targets stop seeing you as a neutral source and push back. Learning that the Globe has launched its anti-Trump editorial tirade reaffirms my decision to cancel my subscription shortly after the election. I wish I had done it sooner. Thank you for such a powerful presentation on the necessity of the press and of supporting our journalists. While I believed in this already, it was great to have more fodder for arguments in the future. Even though this will probably not convince anyone who agrees with Trump about the press — and perhaps even give them evidence that the press is united in its opposition to the president — it is vital that we, as supporters of a free press and a representative democracy, continue to speak to each other about the importance of the press, and that we continue to advocate for journalists and true news publications in whatever ways we can.